I saw Rio over the weekend and my I just say WOW WOW WOW! The film was spectacular!!! 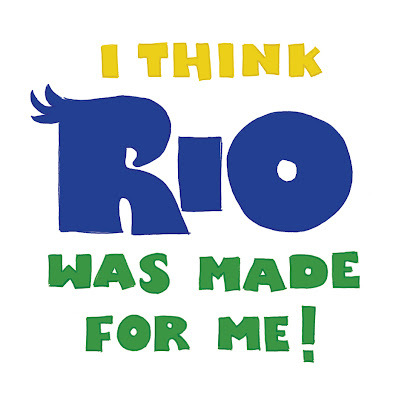 I do realize I have a self-serving bias but a movie about tropical birds that takes place in Rio DURING Carnival- come on! That has me written all over it :) I am in love with this movie! There were some very powerful and relatable themes going on as well. Messages about species extinction, environmental protection, connecting with you're inner strength, finding true love and believing in yourself were all explored during the movie. Talk about feel good! I really like the idea that through this movie children will be exposed to images of Carnival, and in turn inquire what carnival is all about. The soundtrack is killer! The title song 'Real is Rio' has been on repeat on my iPod since Saturday, I can't stop listening to it! Over the past few years or so I have been trying to keep up with sambas in competition for Brazil Carnival, I felt the title song remained true to pulsating Brazilian samba rhythms (YAY for not North American-ing it up!). THAT'S WHY WE LOVE CARNAVAL!!!!!"